Today's modern art forger is capable of producing fake works of art so perfect that even trained experts are unable to spot them. Even down to the most minute details of the pigments, binders, and canvass, these fakes are almost better than the works they're based on. But thanks to a byproduct of the Atomic age, the art world has a potent tool for finding forgeries. Since the start of the 1960s, the art world—especially the modern art world—has been besieged by a torrent of faked "masterpieces." Peggy Guggenheim (yes, that Guggenheim) was once famously duped into purchasing what was believed to be a canvas painting by French artist Fernand Léger completed around 1913. It hung in her private collection for decades before being revealed as a forgery. This problem only expanded through the 1980s and 1990s as the market for modern art exploded. 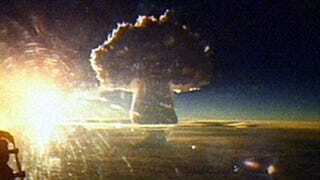 The world's nuclear nations exploded 550 nuclear weapons during tests between the years of 1945 and 1963 when the Limited Test Ban Treaty outlawed all above-ground detonations. 552 if you count Hiroshima and Nagasaki as well. One of the unintended side effects of these tests was the release of two fully-artificial isotopes that only form during a nuclear bomb blast: caesium-137 and strontium-90. These isotopes were absorbed by the soil and incorporated into the cellular structure of plants. In fact, they were absorbed by just about everything—soil, plants, animals, people—everybody alive in between 1945 and 1963 has elevated levels of these isotopes compared everything that lived before that time. This is trend is known as the "Bomb Peak." Since the implementation of the Limited Test Ban Treaty, the environmental prevalence of these isotopes are falling back to pre-atomic age levels, though with a half life of roughly 29 years for both isotopes, they're going to remain in the soil for centuries to come. So when, say, a flax plant growing in contaminated soil is processed into linseed oil (a common pigment binding agent), those isotopes remain. This provide scientists with an easily identifiable timestamp—if there's caesium-137 and strontium-90 present, the work of art clearly could not be before 1945. Now that doesn't mean that if the isotopes aren't present it simply isn't an old forgery, just that it was produced before the start of nuclear tests. Basner's test, which she developed with freelance chemist and Russian avant-garde art lover, Andrey Krusanov, only requires a miniscule sample of canvas taken from the edge of the frame to be run through a mass spectrometer. So What About the Guggenheim Painting? It was a fake. Working with Dr Basner and employing the Bomb Peak technique, the piece in question exhibited significantly elevated isotope levels that placed its production somewhere between 1959 and 1962—four years after Léger died.